Someone surely took the time right there. Almost two years since “Rock The Nations”, and just before hitting the last nails in the decade’s coffin, SAXON were back with “Destiny”. Other than the musical direction, which is to be discussed, personnel wise, another lineup change took place with the departure of Nigel Glocker. Taking on the chance to form a band with YES / ASIA / GENESIS members seemed quite an opportunity, so the guy seized it. Therefore, the young Nigel Durham took the skins. “Destiny”, after the somewhat controversial “Rock The Nations”, in my view, was SAXON’s only true Hard Rock / AOR that resulted as a work of wonders. I know SAXON fans would probably stone me for saying this but I felt that the guys were on a move to become a melodic Rock entity that rapidly mastered the arts of writing songs that would make their listeners, mostly first timers, to rejoice. Their songwriting style changed to the point that it still enabled them to continue to Metalizing stuff up but to also far reach into the hot pot of melodic Rock, you might also refer to it as AOR. There were certainly signs back in “Innocence Is No Excuse” and of course down the road in “Rock The Nations”, however, only within “Destiny” I noticed how SAXON capitalized massively on the AOR wave to make themselves one with the pact. As a general observation, though straying far away from their Heavy Metal heritage, 1988 for me ears had SAXON closer to the top. There was a first time for everything, starting a record off with a cover. Similar to what SAMSON did back in the day with “Riding With The Angels” of Russ Ballard, SAXON made a decision to cover Christopher Cross’s “Ride Like The Wind”, a tune initially written by an American singer who was celebrated by Biff Byford. Distancing from the original version, the band created a heavier version in the spirit of their Hard Rock / Heavy Metal mixture. I had the privilege of watching them perform the song live, and on both occasions, it was simply a mesmerizing experience. “For Whom The Bell Tolls” was quite a surprise for me, putting things into energetic motion. Delivering NWOBHM riffery, SAXON hinted with conviction that there is always a place for their early craftsmanship of strong vibe Heavy Metal. Enchanted by a harmonious chorus, with an addition of melodic riffs, an amazing hit was founded. “I Can’t Wait Anymore” was one of the album’s top singles, alongside “Ride Like The Wind”, features one of the best SAXON AORish contribution to the late 80s period that was swarming with such songs of the American nation. Soft, melodic and embraced by a tremendous vocal performance, strengthened by a choir of backup singers, alongside a wonderful guitar work. Therefore, another winning chip in the slot. “Song For Emma” maintains the salvo of AOR decisiveness. It sounded too sweet I’d say but it was undeniable, SAXON were on fire with their songwriting. As if they had been abiding the AOR doctrine for years, I dare to say that the manner of the song made SAXON sound larger than life. Coming to think of TOTO / JOURNEY / DEF LEPPARD, some of the champions that achieved wonders for AOR while listening to the tune. “S.O.S.” is melodically driven, enticing with an harmonious main riff. At times it was hard to believe that it was actually SAXON, especially with such atmospheric vocal harmonies. Even so, true to their old form or not, it was another proof that their perspective of forging melodic Hard Rock / AOR made them bigger in contrast to other bands of the same direction. Certainly one of the album’s foremost contenders. “Calm Before The Storm” is much polished and neater than their early days, there is a slight comeback to the early savagery, nonetheless, SAXON strongly assimilated into the depths of AOR, attributing a cloud of Keyboards and the almost strict formula of the radio friendly vibe. Thanks to the guitaring efforts of both Quinn and Oliver, the SAXON traditional vibe appeared to be alive and well. Though short on band photos this time, only picturing two, and one on a merch shirt, the booklet of this media book offers the artworks of the singles, a few advertisements of the period and of course, lyrics and a short liner note. It occurred to me that unlike the music, there was not much photographic material that was savored to later use. Anyway, music wise, bonus gems are always a pleasure. Great quality B-Side live performances of “Broken Heroes” and “Rock The Nations”, 12’ mix of “I Can’t Wait Anymore” and two monitor mixing of two other of the album’s hits, “Ride Like The Wind” and “For Whom The Bells Tolls”, surely the foremost bonus pack of this reissue run. Whether considered as true SAXON, or the other way around, “Destiny” on its own is a special unification of the harder edges of Rock, Heavy Metal and sweet melodies. It is an album of easy listening hits, an off road once in a lifetime experience that was widely proved in the next album. 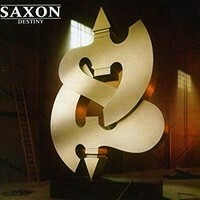 After “Destiny”, SAXON signed with Virgin Records for the release of their first touch with the 1990s, “Solid Ball Of Rock” and like a ton of Rock, they still go strong.